Summer is officially here at the Sofitel Los Angeles at Beverly Hills' latest restaurant pop-up, Cattle & Claw. With seating available both outside and on the whimsical garden patio, Cattle & Claw brings a level of trendy, yet casual comfort to Beverly Blvd. The menu is simple but strong featuring two items—burgers and lobster—in a variety of ways. Before digging into the food though, I recommend starting with a cocktail. I especially enjoyed the Moscow Mule, while my friend loved his Tom Collins. As far at the menu goes, you can certainly just order a burger or a lobster item, but if you want to get the whole surf and turf experience, I would encourage you to order the Cattle & Claw #1 if sharing between two people and the Cattle & Claw #2 if sharing with more. Or if the two of you are just very hungry. 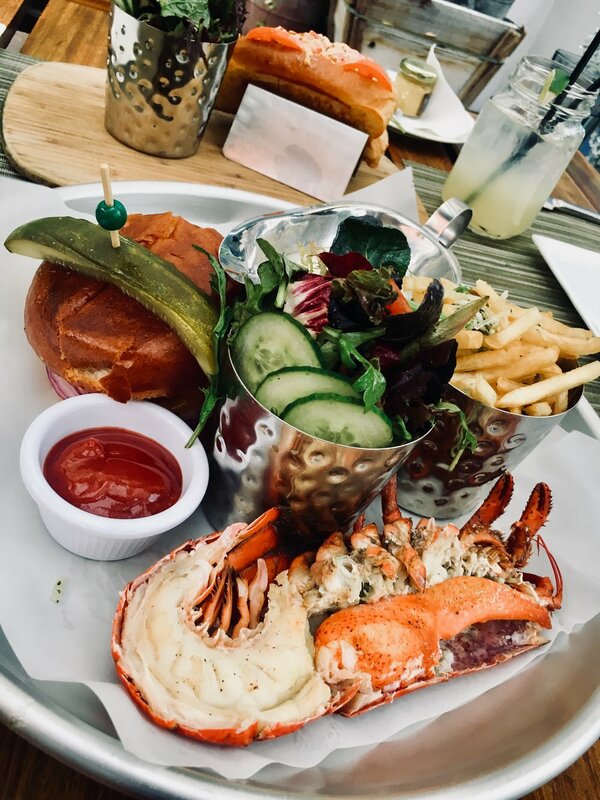 The #1 comes with a 5oz burger, a half lobster, fries, and a salad. The #2 is the same except it comes with an additional burger as well as two lobster rolls and a whole lobster. My friend and I indulged in the #1; We got the burger cooked medium with lettuce, tomato, onions, roasted red pepper, garlic mayonnaise,cheddar cheese, and bacon. The burger was delicious, and I found the garlic mayo to be especially good. The half lobster was served poached with tarragon cream, and it was terrific. Light and filling. Our waiter suggested also ordering a lobster roll, and I am so glad we did because it may have been the highlight of the menu. Served in a remoulade sacuce, the lobster roll took me back to summers in New England. I might have to come back just for that. Definitely save room for dessert, because they are wonderful. We enjoyed the tiramisu and cheesecake. If you were only getting one, I'd pick the tiramisu. But you really can’t go wrong with either. The service is also truly excellent. The team was attentive and kind and provided great guidance in navigating the menu. While it was slightly overcast the evening I dined at Cattle & Claw, I can imagine on a beautiful summer afternoon, this magical patio would be the perfect place to dine on quintessential summer fare.